Today I went to Aldi for some milk, but there, these Mexican pepper beauties are pleasure to buy. So i bought them with out a thought of 'what to make'?. After coming home when I was browsing a Health Magazine, this colorful Poblano Avocado Salad caught my eye. Ola! What a coincidence. I have made alternatives to this recipe and a healthy and unique Mexican salad is ready in minutes. Here is the recipe for you. Enjoy!! Source: Health Magazine. I replaced the Jicama with mango, red radish with shredded carrot and sunflower seeds with Pecans. Take 1 Tbsp of Olive Oil in a bowl, add pinch of salt, 1/2 tsp of black pepper, 1/4 tsp of paprika ( red chili powder) , 1 tsp of lime juice and1/2 tsp of honey. whisk all the ingredients together well. 1. Roast the Poblano Peppers in the oven at 350 F for 15 minutes, turning them all over to roast evenly. After that keep it in the Broil mode on High setting for 5 minutes or until the skin becomes loose. 2. Take out the peppers out side and let them cool and stem, skin and seed out them and cut into 2 inch slices. 3. Cut the Avocado and seed out and cut in vertical slices. 6. Take salad plates and first arrange the poblano pepper, mango slice and top with avocado slice. 7. Similarly layer for 2 or 3 times (it looks like a small tower now). 9. Top it with Shredded Carrot and Sprinkle the crumbled Pecan and Walnut mixture. 10. Yum! Yum! Yum! this Mexican Delicacy is ready in minutes for you. Serving Tip: This salad can be served followed by any Mexican Rice. 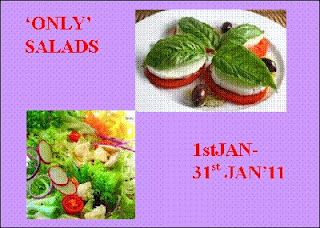 I have submitted this recipe to 'ONLY SALAD's event hosted by Prathibha, which is started by Pari of Foodelicious. And if you could link this one as well??? Have a great week.